In 2010, the Land for Maine's Future and North American Wetlands Conservation Act programs enabled Bangor Land Trust to purchase two parcels totaling 87 acres. 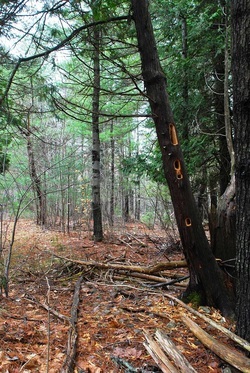 In 2013, another 94 acres were purchased for a total of 182 acres of forest and fields. You can enter this preserve from Essex Street via a small parking area just below the level of the road 400 yards south of the intersection of Burleigh and Essex Streets. A narrow, double loop trail is open to foot traffic only (skis and snowshoes are okay too). The total distance of both loops is 1.8 miles. The trail on Central Penjajawoc is for pedestrians only (no bikes). This trail does not connect with any other trails and has not been prepared for mountain bike use. BLT does maintain many miles of trails on other preserves where mountain bikes are welcome. Out of consideration for the wildlife here, and other human trail users, please leave your pets at home when you visit this preserve.